Elon Musk as a Simpsons character? Coming this Sunday to a small screen near you! Elon Musk is going to be on an episode of The Simpsons as announced by Simpson's Producer Al Jean. Will Mr. Musk survive the wrath of C. Montgomery Burns? Tune in Sunday, 25 January 2015 to find out! 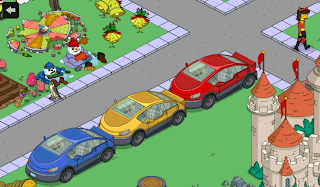 And for fans of the game The Simpsons™ Tapped Out (on iOS or Android—Yours truly is plays under the moniker of TimeHorse, naturally), here's a picture of all three premium item Electric Cars modeled by one of the rarest of premium characters, Shauna, in her Halloween She-Devil outfit. Alas so far most of my friends on the EA forum users stuck in ICEs or walking (forgot to put a no-car option because you can't get more environmental than that). Thinking of buying a Tesla? Here some great reasons to buy and some important disclaimer for folks in the Commonwealth of Virginia. It is my belief as an already electric car driver it behooves me to write the caveats in hopes that Tesla and I, once we get those papers filed and service center in Fairfax Country, Virginia on Tyco Blvd., can work together to break the backs of the hybrid lobby and show Richmond and Fairfax that Electric Cars are the future. The US government offers a $7,500 federal tax credit when you purchase a new Tesla. Yes, the tax credit is helpful, but only if you pay at least $7,500 in taxes. As this would typically be someone earning $40,000 per year or more, I don't think it needs a caveat since no-one earning only $40,000 per year could *every* *dream* of owning a Model S at the equivalent of 2 years salary. Clean Fuel plates are grandfathered, meaning the hybrid drivers ate up all the good ones and all that's left are third-generation access that only allows HOV access on a toll road in Northern Virginia. We need to work to wrest those first-generation Clean Fuel plates attached to dirty priuses and civic hybrids from those smelly, polluting, dirty cars and reissue them to the proper, truly clean, 100% cars like the Tesla Model S and the car I drive which I won't bother mentioning because I'm just here to promote Tesla and the Model S, even while I can't afford one. But maybe this point is moot since most of the HOV lanes in Virginia are being replaced by toll-based HOT lanes where the Clean Fuel plates don't even qualify. Local governments may reduce personal property taxes paid on electric vehicles. Some local governments reduce your property tax burden by as much as 50%. For example Prince William County, Arlington County and the richest county in the nation, Loudoun County, all provide property tax discounts. However, the most populous and third richest county nationally, Fairfax, provides *no* property tax discounts what-so-ever, not for hybrids, not for electrics. And the property tax on a Model S can be as high as $2,500 per year. Though I suppose if you can afford a Model S, you can afford a property tax bill which represents your approximate fuel savings. And let's not forget, Fairfax County is where the Tesla Showroom and future Service Center are located. Virginia Dominion Power offers reduced residential rates for electric vehicle charging. Dominion's rates are why I used to pay $2,500 on fuel before getting an EV and now pay less than $300 per year for fuel. The electric cost per kWh out of pocket (including tax, generation, distribution and all riders) can be as low as about 6¢/kWh. But there is a caveat for this too, since Dominion now requires you to put your whole house on Time of Use for this rate, meaning if you have a stay-at-home parent and kids you'll be running the air conditioner and if you have a heat pump the heater seasonally at peak rates, though the rates fall into 4 tiers so the evenings aren't too bad and the overnights are dirt cheap. They used to offer a two-meter solution but having gone this route I will say for me it's hard to consider it worth it. While the whole house solution has effectively no cost to the customer to install, the two meter solution added perhaps $1,000 more installation costs after EVSE tax credits, which would take years to realize in saving relative to the whole-house option. Then again, I calculated this based on the fact that I don't have a stay-at-home parent in my house. Electric vehicles are exempt from biannual emissions inspections. True, but safety inspections are still required. Let's not let drivers forget this lest they wish to get a ticket for failing to get their car inspected annually. Most importantly… NEVER PAY FOR GAS AGAIN! Again, true, but what anti-EV Richmond did, secretly in the dark of the Hybrid Lobby highly public excision of a $64 surtax is leave that surtax on Electric Vehicles, in addition to a $50 per year tax already imposed on Electric Vehicles. So effectively, Electric Vehicles are taxed $114 annually for use of the Virginia Roads (fuel taxes) which is, as far as I can tell, the highest fuel tax in the nation on EVs. Compare this to a 50 mpg Hybrid driving the average 15,000 mi per year. This represents only $48.60 in taxes for fuel at the rate of 16.2¢⁄gal as of 1 January 2015. Thus, for 15,000 mi traveled per year an EV pays more than twice that of a hybrid in Virginia. This is something which we need to fix. Never should a hybrid be taxed less than an EV. It's wrong for Tesla, and wrong for all of Teslas EV-driving supporters.